It’ s been a while since we talked fitness, but that does not mean I changed my habits. Not at all, certain things are truly set in stone for me. My first fitness review was back in September 2011, when I shared my thoughts on the gruesome but efficient P90X. 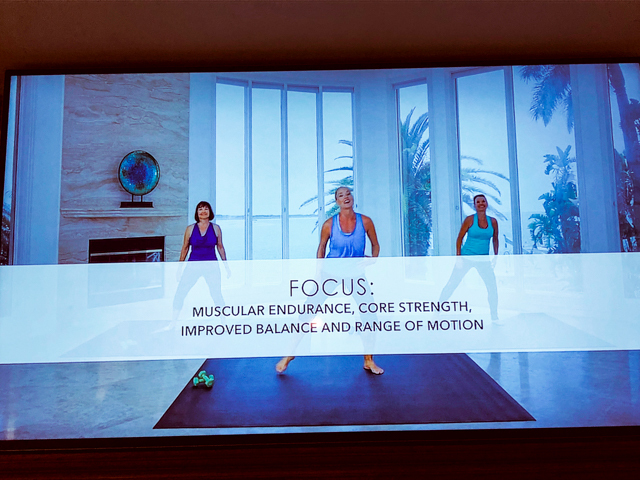 Since that time I’ve reviewed the other sequels of Tony Horton (P90X2 and X3), a program from Beachbody called Focus T25, and last March Jessica’s Walk Strong, which, together with countless options she offers online (for free), settled as my present routine of choice. Let me then walk you through the program. If you are new to Jessica’s approach, you might wonder why her fitness routines all have the word “walk” in them. Basically every session involves walking, either in place of moving around front-to-back or side-to-side. Except, of course when you are doing floor exercises, but they are usually a minor component (time-wise) in the videos. What that means is that you are moving constantly. You might be targeting your shoulders, triceps, or upper back with dumbbells, but your legs will be moving at the same time, which also will bring your heartbeats up, for added aerobic boost. It would be too long and convoluted to go through the 20 different workouts in a review, so I will go in detail through those comprising the first week as an example. The first day covers basics, going over proper form required for all videos ahead of you, and a short workout called 1-Mile of Motivation. On day 2, the fun begins, big time. As far as equipment goes, it is absolutely necessary to get dumbbells, and a mat. Without those, you won’t be able to perform many of the routines, although many require exclusively your body. Additional options (not required, but nice to include) are a small step, and a very light foam ball. I provided links to amazon, but I am not affiliated, so no bonus for me if you order any of those items. In my mind, those are worthy investments. I take exercising very seriously, and just like in cooking, having the right tools for the job is part of the equation. Again, you can do all videos without these last two items. So let’s dive in. Metabolic Conditioning (Day 2) I can tell you this workout will catch you by surprise because it can be quite challenging. Not only – in typical Jessica’s fashion – you will not stop for a single second during the 30-minute session, but the mixing of dumbbells with step moves will turn what seems like a weight-training workout into aerobic territory. You will break a sweat. First time I did it, I was a bit ambitious and set my step with two raisers. Big mistake, considering I am very petite (5 ft tall if I stretch my neck pretty hard). I also went a bit heavy on the dumbbells, but quickly realized my mistake and adjusted mid-way through. A very nice opening video to start the program, pretty much a full body workout, with core exercises to wrap it all up. Barefoot Cardio Core (Day 3). You can use a foam ball for this, again it is not mandatory, and Jessica’s Mom demonstrates how to do the whole series without one. A very flow-y routine, that nicely targets the abdominal region, but all with stand-up exercises, and again, non-stop walking. My favorite part is the final 8 minutes or so. That final stretch mimics classic floor routines – think for instance laying down oblique bicycle moves – but since you are standing up, the neck is spared of any strain. Also, she incorporates Pilates and yogic moves that challenge balance and core strength. A winner of a routine, in my opinion. It targets the core and abdominal region with moves that you perform daily, grabbing things, twisting, lifting. Awesome. If you have issues doing exercises barefoot, no problem, put some shoes on and have fun. Total Body Workout. It is important to have a friend to check your form. Total Body (Day 4). In the WalkStrong3 system, you have three videos that together could make up a very nice series to rotate over and over. Total Body (introduced in the first week), Upper Body (second week), and Lower Body (also second week). They do exactly what the title implies, using dumbbells in 30-min routines that target the full body (Total Body) or more geared towards upper (arms, shoulders, upper back), and lower regions (legs, hips, thighs). All of them devote some attention to the core, and all of them keep you moving full-time (Walk Strong, remember?). After I finished the 8-week cycle, I found myself going back to these three videos quite often. You can adapt each routine to your level of fitness by increasing or decreasing the weights, going lower on squats, adding a little jump to lateral or forward moves. Debbie usually demonstrates lower impact moves, and Beth pretty much goes for the kill. Follow Jessica’s words of wisdom and listen to your body. An advice I often disregard completely. Rebel. My middle name. Boogie I.T. (Day 5). Interval Training. If you follow the trends, this is a big one right now. It is clear that short bursts of high intensity activity followed by more mellow moves is a great way to approach fitness. This is a fun DVD, the music is great, the moves are not complicated, and the high intensity component will have you grasping for air. But as is always the case, they are short enough that you can hang on and feel fantastic when that stretch is over. Quoting Tony Horton, “you can do anything for 30 seconds!” I think it is a good workout for beginners, even if you’ve never done interval training before, because you can tone down the intensity of 30-sec high intensity bits. You can also increase the overall challenge of the workout by jumping higher or moving with more intensity throughout the full 30 minute session. As is the case for all her DVDs, you can adapt according to what suits you. Cannot stress that enough. Tone + Flow (Day 6). A nice way to wrap up the first week. It is deceptive in the sense that the pace is slow, but exactly there lies its challenge. Sometimes fast pace makes exercising with weights easier, because we rely on momentum. In Tone and Flow, you are handling light weights, and going through each movement slowly, with focus and attention. It changes the game, for sure. There is also quite a bit of attention to balance, in Pilates fashion. I love it. Final Day is rest, or you can follow the DVD called Deep Stretch. Every week closes with a rest day. So that is your first week, summarized. As you can see in the first picture on top, the calendar marks each day with one of three colors. Blue for moderate effort, Red for Moderate to Higher Intensity, and Yellow for Active Rest. No week in the full program goes for more than four days of Higher Intensity. But you should keep in mind every single routine is adaptable to any level of fitness, from beginner to advanced. It is your body, it is your call. You are in charge. 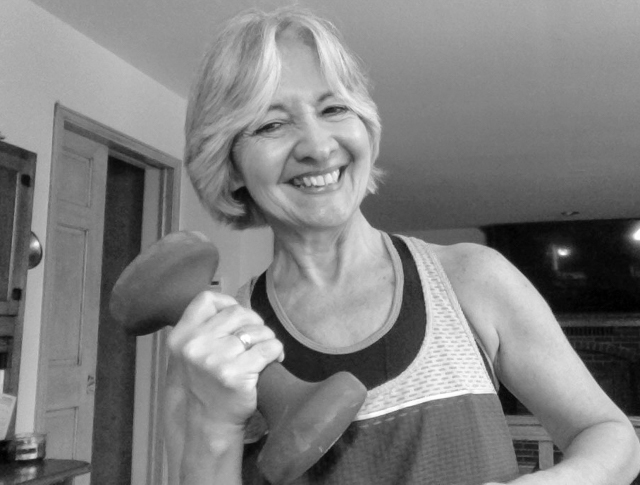 Bonus Review: Barre Sculpt. I love this one so much, I need to highlight it. This is a routine that shows up at the end of the second week. I had been exposed to Jessica’s barre workouts through her youtube routines, and fell totally in love with them. Before you pose the question, no, you don’t need to install a ballet bar in your home. Jessica adapts ballet exercising using any chair with a high back, or you can use a high countertop. Pretty clever! I was thrilled when I realized that the WalkStrong3 incorporated Barre Sculpt. The routine involves simple ballet-inspired moves that are performed many, many times, with dumbbells and the optional foam ball. You take each muscle group pretty much to fatigue. I am always pleasantly sore next day, with that feeling of a full body workout under the belt. Barre Sculpt is another routine I went back to over and over after I finished the program. I would like to bring back six specific points I made in my first review of Jessica’s Walk Strong, because these are so important, particularly if you have never heard of her before. 1. Jessica does all the routines. No stopping to highlight details or correct someone else’s form. She does every single move, beginning to end. Even though she is actually doing each exercise and instructing, she never misses a beat. I have a huge pet peeve with fitness instructors who get lost in the number of repetitions, and might cut short the series in one side of the body versus the other. This never happens on Jessica’s videos. Plus, you are never lost in the flow of movements because she tells you what will happen next, will even tap quickly the leg that will start the next movement, so that from the first time you use a particular video, you can follow it. 2. No rest for the wicked. Thirty minutes of exercise means non-stop action. Once you start, there will be NO break. Maybe for some this is a drawback, but I find it great. The heart rate keeps up, time is used very efficiently. The closest thing to a break is having to switch from a lighter to a heavier set of dumbbells, or go from standing up to laying down. More on this later. 3. Thirty minutes are easy to stick with. One of the toughest things of the original P90X or other programs is the time involved. You need to spare sometimes one hour or more, which can be pretty hard to do when you have a busy schedule. Thirty minutes are easy to devote to it. C’mon, most people will sit and surf the net for longer than that when they get home from work… Why not devote these precious minutes to taking care of your body? It’s a no-brainer! 4. Real people in the videos. Cannot praise that enough. Every single video I’ve tried has “real people” in it. Healthy women with healthy bodies, wearing regular exercise clothes. The setting is nice, elegant and simple. 5. Background music. Another detail I fell in love with from the first video. The types of songs played are very diversified, from upbeat songs to Middle Eastern tunes, Japanese music, never too loud, and perfectly matching the exercises they go with. 6. Attention to form. Cannot stress this enough. Jessica will remind you constantly of details to pay attention to, from placement of your chin to tightening the core, where is your knee during a squat, how to position your hand while holding a dumbbell. And, something I do have trouble with, how to coordinate breathing with the moves. With those in mind, now that I’ve been using Jessica’s videos for about 16 months, I want to reinforce one particular characteristic that makes her program special. The fact that you exercise non-stop for 30 minutes. Now, let me address some questions you might have. I have not exercised for years. Will I be able to follow WalkStrong3? Yes, yes, emphatic yes to that. No doubt in my mind. Maybe you will be better off by taking two days off during the week, so the full program would take you closer to ten weeks rather than eight, but seriously, do you really care if you wrap it up on day 56 or 70? I think it is irrelevant. What you want is a program you can stick with long-term. A program that will bring results without injuring your body. Give it a try. What is the minimum equipment I need to buy to do the program? I’d say two sets of dumbbells, one light, one medium-to-heavy for your size. One exercise mat. With that you can do all exercises in all videos. Modifications will be offered whenever a step or a foaming ball is used. How long until I see results? That is a tricky question, very hard for anyone to address. It obviously depends on what you define as results. If you expect to see a 6-pack abdominal region, you should keep in mind that to reach that level most people need to couple a very restrictive nutritional system with super intense targeted routines. Think CrossFit, which I have strong opinions about, but will spare you of them for the time being. If you define results as muscle definition in arms, legs, abdominal area, I’d say in 4 to 6 weeks you will notice improvement. But more important than what you’ll see is how you’ll feel. The system covers so many different types of exercises, from aerobics to stretching, from weight training to balance, no muscle is left untouched. You will feel energized, and happy you’ve started this path. As designed, the program flows in a way that different areas of the body are challenged at different times, and after a very intense couple of days, she will bring a more mellow routine to prevent injury but keep your body moving. How does it compare to Jessica’s previous program? I think WalkStrong3 is slightly more challenging, and also more “complete” due to the variety of routines. The inclusion of Barre workout definitely places it on a higher level, in my opinion. The weight-training component is more intense, and many of the routines incorporate advanced Pilates moves that were not present in the previous program. In all cases you can dial back if necessary. The yoga routines are about at the same level in both programs and they pop up in the schedule at very appropriate times. It is a very well-designed system you can see she put all her fitness knowledge to work to come up with WalkStrong3. What happens after I finish the program? If you haven’t exercised in a long time, I hope that when you wrap up the 8 weeks, you will be so hooked into the routine of sparing 30 minutes of your day for fitness, that you’ll keep going. Not only you can repeat the system again (if you prefer not to think about changes and just stick to the printed schedule), but you can go to Jessicasmithtv and indulge into hundreds of exercise videos that she offers for free. Free. You read me right. You can search according to time (let’s say you only have 15 minutes to spare today), to the part of the body to focus on (legs, upper body, abdominals only), to type of exercise (barre, aerobics, weight training), and make a list of your favorites, hit play and exercise whenever you want. You can target exercises to the regions of your body you feel need more attention. Maybe it’s the inner thighs. Maybe the shoulders. Maybe you feel your flexibility needs extra attention. Jessica has countless yoga sessions that are user-friendly, in the sense you don’t need to turn your body into a pretzel to follow her. After finishing her newest program, I now do a pretty varied schedule of exercises, but I’d say 90% of them involve some type of Jessica Smith video. The remaining goes for old favorites, like Chest and Back from P90X, The Challenge from P90X3, Plyometrics from 90X or 90X3. I go according to my mood, or to be completely honest, according to what hurts today from the excesses of yesterday (wink, wink). I hope you enjoyed this little virtual tour of Jessica’s WalkStrong3. I strongly recommend her videos to anyone who wants to improve the level of fitness, no matter how old, no matter how much of an exercise-hater I’m talking to. Starting and sticking with a fitness program is by far the best move you can do to improve your health. Jessica can make that move a very pleasant one. Very cool. Now I feel guilty all of the time. The puppy checking your form is adorable, and I want to know who took the photos. I’d love to try this if I could ever get my dvd to work, lol. That’s my excuse and I’m sticking to it. In the meantime, I spin at work! Phil took the photos… he did a great job, didn’t he? I do Jessica’s workouts and have WalkStrong3. Another plus of this program is that your body will move in all directions/planes, not just forward and back or from left to right. I was interested to read what the metabolic conditioning workout was, I think I’d like that. And I think my poor arms would be much happier with lighter weights and more reps! and actually you were the one who first showed me her barre workouts.. remember? I had no clue what they were, and then became super fond of them – it was great to realize she incorporated a nice one in the new program…. I do remember 😀 that poor standing leg….! Hi! Thanks so much for your comprehensive review! I’m trying to decide between this program or her original WalkStrong dvd set or even the WalkOn 30-day set since I do have a shoulder injury and can’t do a ton of plank-style exercises. I’m an intermediate exerciser and am looking for a more gentle approach after years of Beachbody’s T25, 21-day fix and Piyo. Any recommendations where to start with Jessica Smith? I absolutely love her exercise philosophy! If I were you, I would do the original WalkStrong set, and baby your injury avoiding anything that could cause you discomfort. ONce you complete that, you could do this latest one, which will be a bit more challenging, but again, you can modify anything to suit you…. she is great, isn’t she? Yes she is! 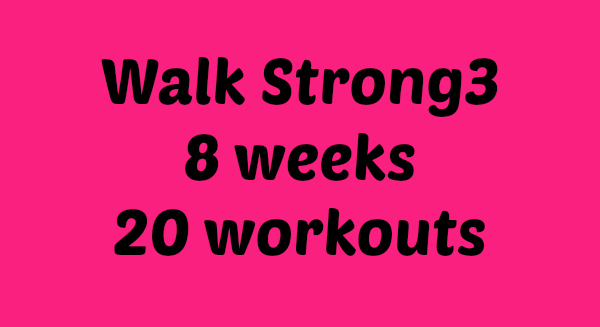 Do you think the Walk On 30 day weight loss set would be too easy? Also if I start with original Walk Strong set would you recommend following up with 2.0 or just skipping to 3.0? Thanks so much for your input- your advice is greatly appreciated!